While the weather remains temperate, the harsh cold of winter is just around the corner. As Old Man Winter sets his sights on Baltimore, has your business considered the working-state of its properties’ boilers? Replacing and repairing boilers are expensive tasks, ranging anywhere from $600 to $40,000, but boiler maintenance training for employees can help your business save quite a bit. A well-maintained boiler system can function properly and reliably for up to 25 years. Training the appropriate employees at your company how to expertly service this vital appliance will save your business the costs of repairs and replacements associated with a poorly-maintained boiler. Luckily, our revered three day seminar, Boilers: Technical & Operational Training is coming to Baltimore September 29-October 1, 2015. This regional seminar will not be offered again in Baltimore for another year, so now is the time to register your employees for this crucial, money-saving course. Still not convinced this training has value for your company? Read through the following FAQs to learn more about how our boiler maintenance training in Baltimore will greatly benefit your company. Q: Why is Boiler safety important? A: Boiler maintenance is critical because it extends the life of a boiler. With the correct understanding of boiler components, construction, and combustion you will be able to recognize safe, efficient operations of commercial and industrial boilers. By applying preventative maintenance to counteract boiler deterioration, proper maintenance of this equipment can greatly benefit a company. Q: Who is eligible to take this course? Q: Will my company see financial benefits to sending employees to this seminar? A: All boilers experience a lot of wear and tear. One focus item of this NTT Training seminar is preventative maintenance to counteract some of the deterioration. The skills learned on how to diagnose, troubleshoot and fix boilers will help reduce costs that occur due to runs to failure and save your company money in the long run. The average cost of installing a standard boiler can range from $2,500-$5,000; a gas-fired unit can cost $3,000-$6,500, up to $6,000-$9,000 to put in a new high-efficiency boiler. Q: What makes this NTT seminar different than ones offered by different companies? A: One of the advantages of attending an NTT Training that you won’t find offered by training centers offering similar classes; is that our courses are hands-on. NTT Training courses combine lecture format with hands-on training so students can apply what they learn to training simulators to experience the same situations they’ll face while on the job. Q: Why should an employer or HR department pay for an employee to attend the seminar? A: By keeping your employees properly trained, they will have better understanding of boilers and boiler maintenance. This will also help them to be safer while on the job and in turn have less downtime and increased productivity. Q: Can you provide some of the student feedback you have received from past seminars? “The boiler seminar was not only informative but the instructor made sure that everyone could apply what he said to whatever equipment they had at their workplace.” – Anthony Moore, Sandmeyer Steel Co.
Don’t endure another winter with an unreliable boiler. 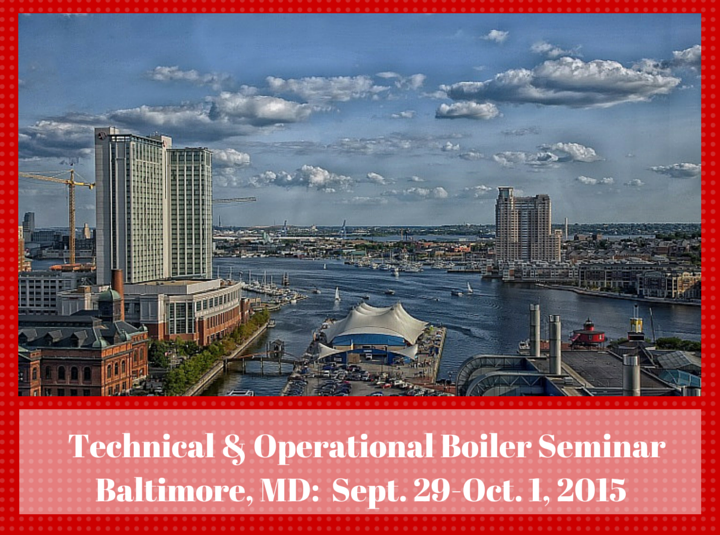 Register for our Baltimore Boiler Maintenance Training Seminar today.